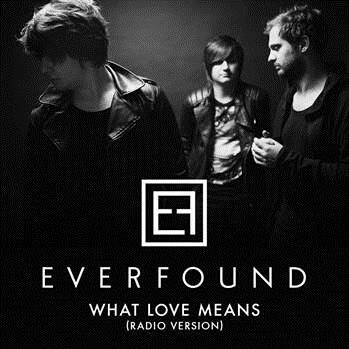 NASHVILLE, Tenn. - (May 12, 2015) - Word Records recording artist, Everfound, is releasing the radio version of their song "What Love Means (Radio Version)" today, Tuesday, May 12, on iTunes and all digital music outlets. The song is also the band's current radio single and is a new version of the stirring song that concluded Everfound's 2013 self-titled Dove Award-nominated major label debut. "This song was inspired by our realization that often times our society and our culture define love in a way that is contrary to the way that God defines love and The Bible defines love," shares Everfound lead vocalist, Nikita Odnoralov. "In John 15:13, Jesus says 'greater love has no one than this, than to lay down his own life for his friends.' That's exactly what Jesus did for you and for me. May we remember Jesus Christ who came, lived, died, and rose again from the dead so that we may understand the incredible love that God has for us." "What Love Means (Radio Version)" comes on the heels of a successful tour with Plumb and after Everfound received widespread attention with "Take This City (feat. Joel of for KING & COUNTRY)." Not only did the song chart in the Top 5 at Christian Hot AC/CHR, it also was featured in widely seen promotions by ESPN's Monday Night Football and Sky Sports UK's promotion of the Manchester Derby. See the Sky Sports UK commercial for the Manchester Derby here. The band plays select dates across the nation this summer. For more information about Everfound and tour dates, visit www.EverfoundMusic.com and follow @everfound on Twitter.